​September’s birthstone is the sapphire—a precious gem of wisdom, loyalty and nobility. This stone is said to focus the mind, encourage self-discipline and channel higher powers.When people say “sapphire,” they’re usually referring to the royal blue variety of this gem, although it can occur in all colors of the rainbow (except red, which is classified as ruby instead). 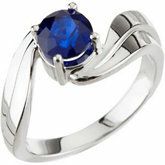 ​September’s birthstone, the sapphire, has been popular since the Middle Ages. Back then, the celestial blue color of this gem symbolized heaven and attracted divine favor and wise judgment.